Although frightening, the detail is very significant to the rest of the picture. 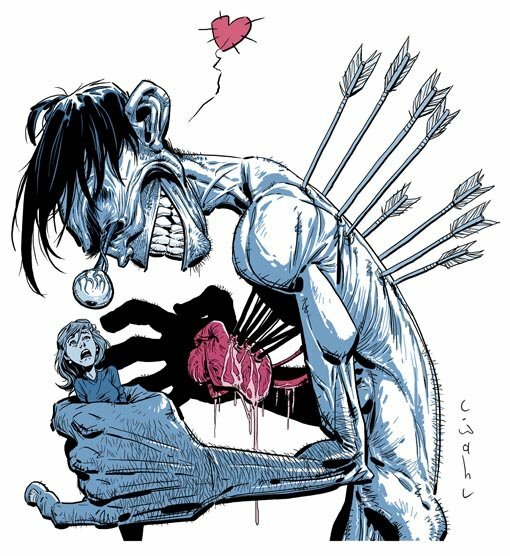 I like how the only color is on the heart, showing how the man in the picture feels. This is great. An obsessed person can truly be a monster, especially if the other party wants nothing to do with them. You did a great job representing this in your illustration. Great job! tammy- Thanks. I'll post the 'kiss' pic up soon. heri- Thanks again. I'm not much of a teacher, but if you have any questions let me know. I liked the detail of the hair on the monster. And I also liked your use of line and color. AWESOME illo!! Love your stuffs, very nice collection of artworks! Thanks alina. Some very cool artwork on your blog. Chris, this is fantastic and has to be the most disturbing illo for IF "Monster" (and probably ever) - really twisted and bizarre!